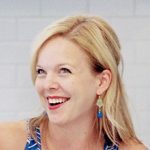 It’s funny when I stop to think about it, but as much as I love coconut, I don’t make much with it or even order it while dining out very often. I tend to gravitate toward chocolate/coffee/caramel dessert options, and more typical fruit centric options would be my second choice. Coconut seems to fall in that gray area of yes, I do like it, but I’ll never choose it over those other options. The solution? It’s obvious. Dark chocolate? Coconut? Put your hands together. These cupcakes are just dreamy. They have a perfect balance between the chocolate and coconut, they are eye catching, and they are fun to make. Dipping the tops to get that perfect smooth chocolate finish on top is just so satisfying! 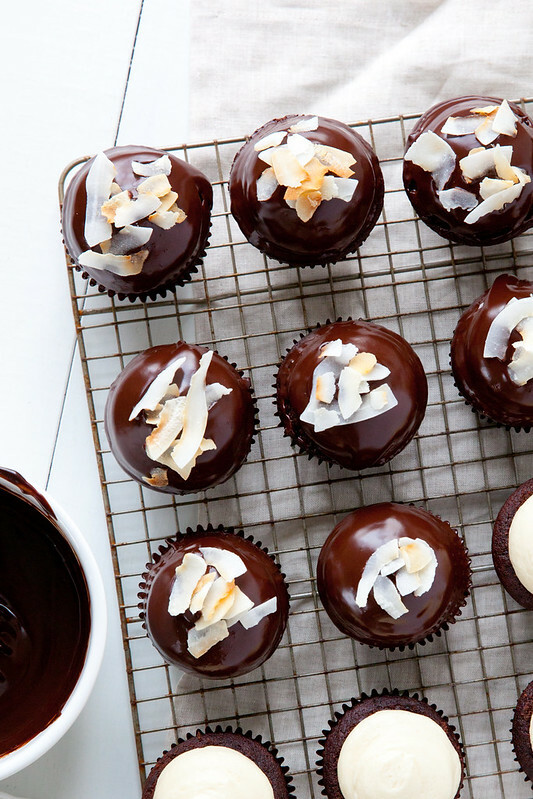 Whether you are a chocolate lover, a coconut lover, or both, these are sure to please. Combine the butter and sugar in a medium saucepan set over medium heat. Cook, stirring occasionally, until the mixture is smooth and the butter is completely melted. Transfer the mixture to the bowl of an electric mixer and beat on medium-low speed until the mixture is cool, about 4-5 minutes. Add the eggs one at a time, mixing well after each addition and scraping down the sides of the bowl as needed. Blend in the vanilla, coconut extract, and then the cocoa mixture until smooth. With the mixer on low speed, add the flour mixture in three additions alternating with the sour cream, beginning and ending with the dry ingredients and mixing each addition just until incorporated. To make the frosting, combine ½ cup plus 2 tablespoons of the heavy cream with 2 tablespoons of the confectioners’ sugar in the bowl of a mixer fitted with the whisk attachment. Whip on low speed at first, increasing the speed to high as the mixture begins to thicken, until stiff peaks form. Keep a close eye to be sure you don’t overbeat and end up with butter. Transfer the whipped cream to a bowl and set aside. In the now empty mixer bowl, combine the butter and cream cheese. Beat together on medium-high speed using the paddle attachment until smooth and light, about 2-3 minutes. Sift in the remaining 2¼ cups of confectioners’ sugar into the bowl and beat into the butter mixture until incorporated, about 1 minute. Blend in the remaining 1 tablespoon of heavy cream, salt, coconut and vanilla extracts. Once incorporated, beat the mixture on medium-high speed for 2-3 minutes until light and fluffy. Using a spatula, gently fold the reserved whipped cream in two additions into the coconut frosting mixture to lighten it, mixing each just until no streaks remain. Transfer the frosting to a pastry bag fitted with a wide plain round tip. Pipe a round dome of frosting onto each cupcake. (I leveled the cupcakes first. This isn’t required but makes shaping the frosting easier and makes a little extra room for the frosting.) 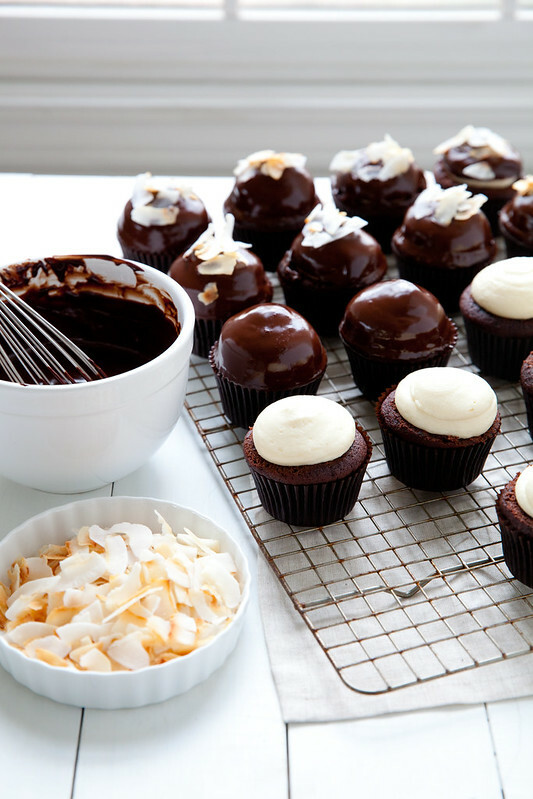 Chill the cupcakes for at least 15 minutes to set the frosting while you prepare the ganache. Place the chopped chocolate in a small bowl. Heat the heavy cream in a small saucepan (or in the microwave) until just simmering. Pour the hot cream over the chocolate in the bowl. Let stand 2 minutes, then whisk until smooth. Whisk in the butter and the rum, if using. 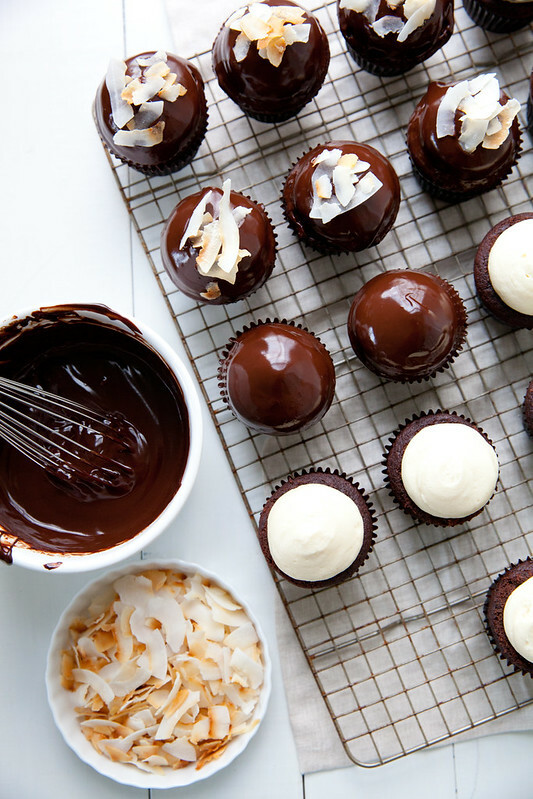 One at a time, dip the frosted portion of each cupcake in the ganache so that it is coated in a smooth even layer. Transfer to a wire rack and sprinkle with a few of the coconut shavings. Repeat with the remaining cupcakes.